As digital transformation sweeps the globe, enterprises recognize it is key to staying at the forefront of their industry, with product development and customer experience becoming increasingly competitive. Rubrik designed its cloud data management platform to revolutionise and modernise data protection. Its ground breaking technology automates manual backup processes with simplicity and ease of use, freeing up resource for innovation and growth. 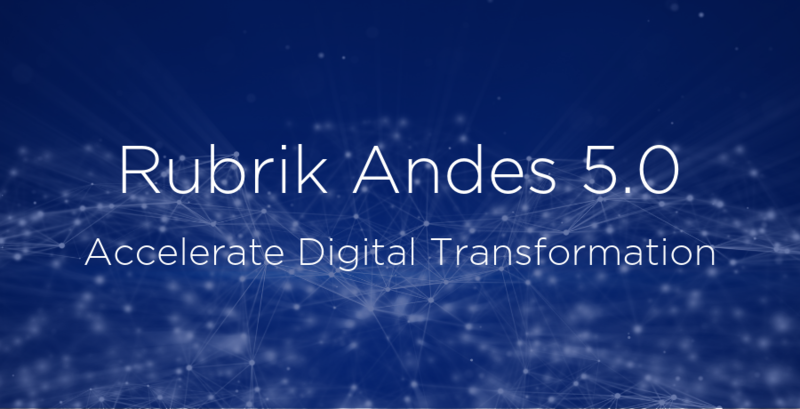 Rubrik Andes 5.0 is certainly the biggest release to date, designed to solve some of the biggest digital transformation challenges for businesses. It creates advanced data protection solutions with cloud mobility, self-service automation, and integration for large enterprise applications and databases including Oracle and SAP HANA. Live mount is now available for Oracle databases which allows for instant recovery and clones in only minutes. Application testing and development can be carried out with just a few clicks and no impact to production environments. With its policy driven automation and auto discovery Rubrik Andes removes the need for manual scripting for even the largest Oracle environments. Policy-driven management enables compliance to be met for archival and replication. Use native tools like SAP Hana Cockpit and Studio for fast point-in-time recovery. Rubrik Andes delivers simplified protection for InterSystems Caché databases. To meet with HIPAA compliance, companies who deal with protected health information can also protect sensitive patient data with end-to-end encryption and immutability from Ransomware. Manage massive unstructured datasets efficiently and securely across data center and cloud. Rubrik software indexes all file system metadata to provide instant access with global predictive search. At Assured DP we work exclusively with Rubrik to deliver this ground breaking technology as a service to large SME and enterprises, both direct and through the channel. Book a 20 minute demo and discover the benefits of Rubrik cloud data management for your business. This entry was posted in Backup, Data Protection, Integration, Ransomware, Rubrik and tagged Backup, cybersecurity, Data Management, Data Protection, data security, Polaris, Ransomware, Rubrik, SaaS.